Press Eye - Belfast - Northern Ireland - 8th September 2018 - RORY BEST AWARDED FREEDOM OF THE BOROUGH AT CEREMONY IN ARMAGH Some of the biggest names from the world of rugby union gathered today at the Archbishop’s Palace in Armagh along with friends and family of Dr Rory Best OBE to witness the sportsman’s conferment with the Freedom of the Borough of Armagh City, Banbridge and Craigavon. The Lord Mayor, Alderman and Councillors awarded the honour to the Ulster, Ireland and Lions rugby star – only the second-ever granted - to recognise his huge contribution to both sport and the community in the borough. Rory Best and Lord Mayor, Cllr Julie Flaherty with the scroll at the Palace in Armagh Rory Best and Lord Mayor, Cllr Julie Flaherty with members of Council at the Palace in Armagh Photo by Kelvin Boyes / Press Eye. 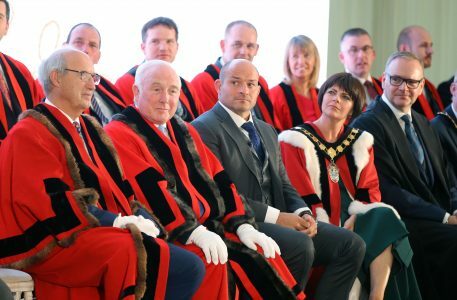 Press Eye – Belfast – Northern Ireland – 8th September 2018 – RORY BEST AWARDED FREEDOM OF THE BOROUGH AT CEREMONY IN ARMAGH Some of the biggest names from the world of rugby union gathered today at the ArchbishopÕs Palace in Armagh along with friends and family of Dr Rory Best OBE to witness the sportsmanÕs conferment with the Freedom of the Borough of Armagh City, Banbridge and Craigavon. The Lord Mayor, Alderman and Councillors awarded the honour to the Ulster, Ireland and Lions rugby star Ð only the second-ever granted – to recognise his huge contribution to both sport and the community in the borough. Rory Best and Lord Mayor, Cllr Julie Flaherty with the scroll at the Palace in Armagh Rory Best, Lord Mayor, Cllr Julie Flaherty and Armagh City, Banbridge and Craigavon Council CEO Roger Wilson with the scroll at the Palace in Armagh Photo by Kelvin Boyes / Press Eye. 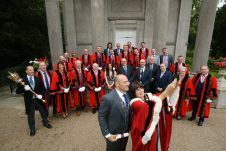 Press Eye – Belfast – Northern Ireland – 8th September 2018 – RORY BEST AWARDED FREEDOM OF THE BOROUGH AT CEREMONY IN ARMAGH Some of the biggest names from the world of rugby union gathered today at the Archbishop’s Palace in Armagh along with friends and family of Dr Rory Best OBE to witness the sportsman’s conferment with the Freedom of the Borough of Armagh City, Banbridge and Craigavon. The Lord Mayor, Alderman and Councillors awarded the honour to the Ulster, Ireland and Lions rugby star – only the second-ever granted – to recognise his huge contribution to both sport and the community in the borough. Rory Best and Lord Mayor, Cllr Julie Flaherty with the scroll at the Palace in Armagh Rory Best and Lord Mayor, Cllr Julie Flaherty with members of Council at the Palace in Armagh Photo by Kelvin Boyes / Press Eye. Press Eye – Belfast – Northern Ireland – 8th September 2018 – RORY BEST AWARDED FREEDOM OF THE BOROUGH AT CEREMONY IN ARMAGH Some of the biggest names from the world of rugby union gathered today at the Archbishop’s Palace in Armagh along with friends and family of Dr Rory Best OBE to witness the sportsman’s conferment with the Freedom of the Borough of Armagh City, Banbridge and Craigavon. The Lord Mayor, Alderman and Councillors awarded the honour to the Ulster, Ireland and Lions rugby star – only the second-ever granted – to recognise his huge contribution to both sport and the community in the borough. 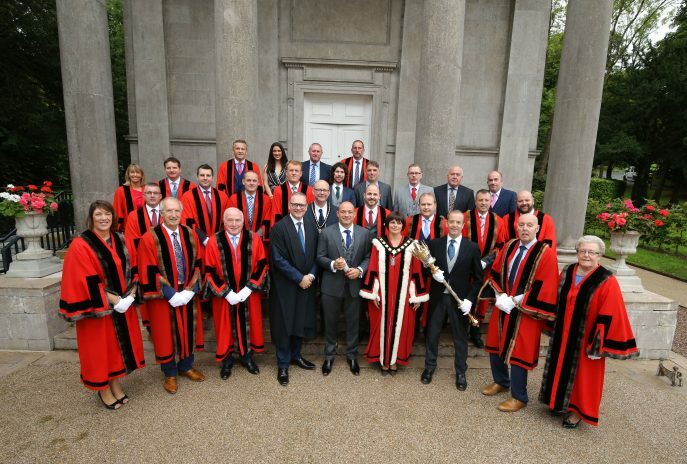 Rory Best and Lord Mayor, Cllr Julie Flaherty with the scroll at the Palace in Armagh Rory Best, Lord Mayor, Cllr Julie Flaherty and Armagh City, Banbridge and Craigavon Council CEO Roger Wilson with members of Council at the Palace in Armagh Photo by Kelvin Boyes / Press Eye.